Interdisciplinary global research network focusing on the investigation of urban environments in the context of globalization and the development of ecological urban design solutions. Gunnar Ploner introduces interdisciplinary master course at Studio1, Faculty of Architecture, University of Innsbruck. The studio is a collaboration between geography and architecture and focuses on the integration of GIS systems into spatial planning. In the first part of the course students will gain familiarity in working with GIS software while in the second part they will apply GIS tools in the course of a geo-spatial analysis of hydro power infrastructures within the Alps. (1) The GIS Lab: As the amount of collected information increases rapidly the availability of precise data enables new possibilities in researching and planning urban environments and landscapes. A geographic information system (GIS) is a system that integrates, stores, edits, analyzes, shares, and displays geographic information for informing decision making. GIS gives data meaning through place. It allows us to observe how cities function. GIS exposes complex processes and dynamics (social, political, economical) taking place in the city. If built physical form is the hardware, GIS and geospatial data reveal the software that operate it. 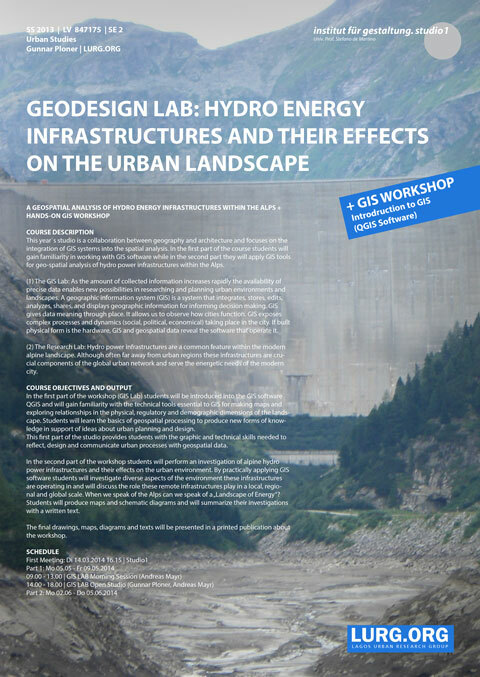 (2) The Research Lab: Hydro power infrastructures are a common feature within the modern alpine landscape. Although often far away from urban regions these infrastructures are crucial components of the global urban network and serve the energetic needs of the modern city.